Upscale casual dining! 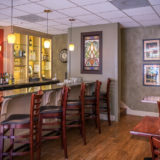 Southern cuisine and intimate atmosphere. Serving fresh, local products when available. Sunday brunch. Full bar. Catering available. Open Tue-Sat 11:30am-2:30pm & 5pm-9pm. Sun 11am-2pm.